Take the pliers and carefully crush the black plastic away from the metal part of the diode. Start at one end and work your way along until you start to find a lump in the metal, and then start from the other end. Connect your diode to your multimeter. Measure its Voltage and the current flowing through it. Then measure it somewhere very dark and again in full sunlight. What happens? You should find that in full sunlight the diode will produce a significant fraction of a volt and a few µA, but in the dark it doesn't even produce a voltage. You have made a solar cell, though not a very powerful one. Ours produced 4µW - so to power a kettle you would need 500 million of them! A diode is often used as a one way valve for electricity, a solar cell is just a specially optimised very large diode. So any diode will work as a solar cell, though not very effectively. 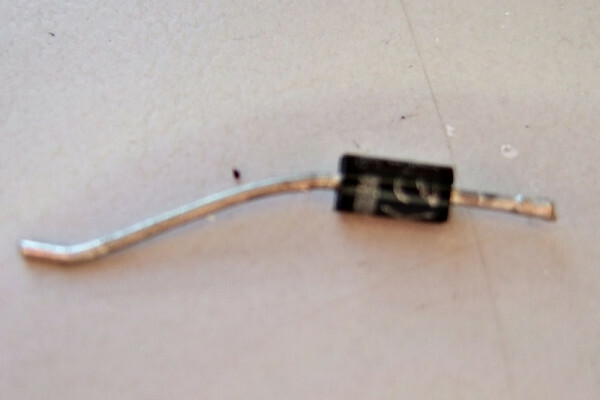 This is why the diode had to be covered in black plastic (otherwise it would start injecting all sorts of strange voltages into its circuit when the sun came out). A diode is made of semiconductors such as Silicon or Germaniumm these are materials on the edge between an insulator and a conductor. Pure semiconductor doesn't conduct electricity as each atom has 4 electrons which is stable, but if you slightly increase the number of electrons these extra electrons can move around easily and conduct electricity. They will also conduct electricity if you remove a few electrons. This is because the hole can move around like a sliding block puzzle, as the electrons move in the opposite direction. It is easiest to think of the hole as a virtual positive particle. You can make a semiconductor conduct by adding electrons. Creating an N-type semiconductor. Or by removing some creating holes which can move around like a positive particle. A P-type semiconductor. A diode is created by connecting a lump of N-type semiconductor to a P-type semiconductor. If you join a P-type semiconductor to an N-type electrons will diffuse into the P-type region and holes will diffuse into the N-type region. This moves charge making the N-type region positively charged and P-type negative. This means that electrons and holes can meet, and when they do they annihilate one another releasing some energy. So the diode is left with a region at the junction with no charge carriers and an electric field across the junction. If this depletion region is hit by light the energy can be used to knock an electron off an atom creating a free electron and a hole. These are pull in opposite directions and have to flow around the circuit to meet up again doing useful work. Light hitting the depletion region creates electrons and holes which then flow around the circuit. Why is a diode a one way valve for electricity? If you apply a voltage to the two sides of the diode depending on its direction it will have a very different effect. If the N-type is made positive and the P-type is negative the electrons and holes are pulled away from the depletion region so it doesn't conduct. But if the N-type is made negative and the P-type positive then the electrons and holes are pushed together and the diode will conduct. Randy Heish sent us these incredible pictures of his own diode-based solar cells - powerful enough to power a clock! The above was taken about 6 inches from a 60W light bulb. I measured about 1.2vdc from the 4 1N400X diodes in series.Just so you can see I'm not cheating - no battery! BTW, I had an article in Circuit Cellar magazine a few years back entitled 'Thermoelectric micropower generation" (issue #113): I used a peltier module with heat sinks and a candle to generate "micro-power" (around 0.5v at 125mA, which I used to power a small AM/FM radio) - quite a bit more power, so this experiment tops the minimal micro-power usage. Thanks again and keep up the good work - a very informative and thought provoking program."